In the world of yield-oriented income investing, you have to accept that the goalposts are always moving. Mr Market is continually changing his mind, lurching between euphoria and despair, swept along by a never-ending stream of news, both trivial and significant. In all this churning activity, for the UK-based DIY Income Investor one important reference point is the undated UK Government Consolidated Loan Stock, with a fixed coupon of 4% - affectionately referred to as 'Consols 4%' (LSE:CN4). This security is a small part of the UK's currently ballooning debt burden but has its origins in debt raised to fight wars. It currently yields 4.1%. So, why do I think this is important? First, this is one of the 'safest' investments, in terms of default risk - as the UK Government is a pretty good credit risk. It is not completely 'risk-free', of course - but more of that later. Second, it is highly sensitive to changes in inflation and the background interest rate environment. Perhaps what is more important is that it is sensitive to expectations of future trends in inflation and interest rate. Third, this is a well traded and liquid security, so is likely to give you a reasonable picture of Mr Market's true feelings. Here is Digital Look's 6-month price trend. Despite the volatility, there is an obvious upward trend in the price, which - given the fixed coupon - means a downward trend in yield. What is driving this? The UK's Quantitative Easing money-splurge, primarily buying up Government Stock (raising the price and thereby reducing yields and interest rates), has come to an end and will at some stage have to be unwound, with an opposite effect. UK inflation seems set to increase and it seems unlikely that the current Government will take measures that would slow down the economy. 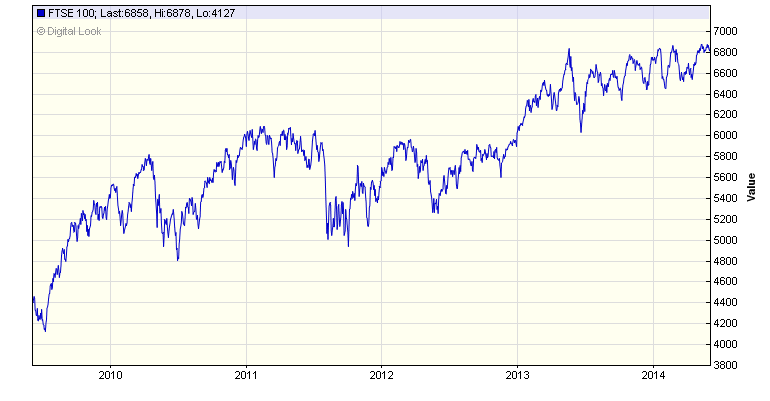 Then have a look at the FTSE 100 5-year chart: hitting new highs. So, prices all-round are rising and yields are falling. Is this sustainable? Or is it another housing-fuelled bubble of euphoria? Except, that is, for peer-to-peer lending. I use Ratesetter to tap into this market. Their latest chart of rate trends shows a small but definite upward trend (shadowing the recent rise in CPI inflation). The 3-year fixed rate is currently hovering around 4.8% and the 5-year rate is 6.1%. Because of their buffer fund covering bad debts, the risk of loss from bad debts is low. So, who is right? Mr Market or do people currently borrowing/lending via Ratesetter provide early warning of trends? For me the answer seems to be to take profits, selectively, and to stick with cash for the moment. However, that is easier said than done in an ISA or SIPP, as there is no real 'cash' option currently. And that brings us back to old Consols 4% - possibly the nearest alternative to cash available in an ISA or SIPP. Perhaps that's why they are currently popular, as the least-worst option to cash? I don't hold any at the moment, although I have held some in the past. And I'm not planning to buy any, for the time being, anyway. With any luck, peer-to-peer lending will be coming to an ISA/SIPP near you soon. Fear of "deflation" in the EU makes CONSOLS a good parking place. Fast traders will always beat the "stop loss orders defence" on equities and buying property in London has gone as far as it will go. I think the UK will normalise after the election when there will be less threat of the politicians "crowd pleasing moves" wiping out your pension, in the mean time, just enjoy every new retail bond launch making 1.5% overnight. 3. Given their high volatility they really are nothing like cash.